Why Buy From Estabrook Toyota? At Estabrook Toyota, we work hard to take care of our customers. We place a high priority on caring for both our customers and our staff, because to us you're our friends, family, neighbors and coworkers. 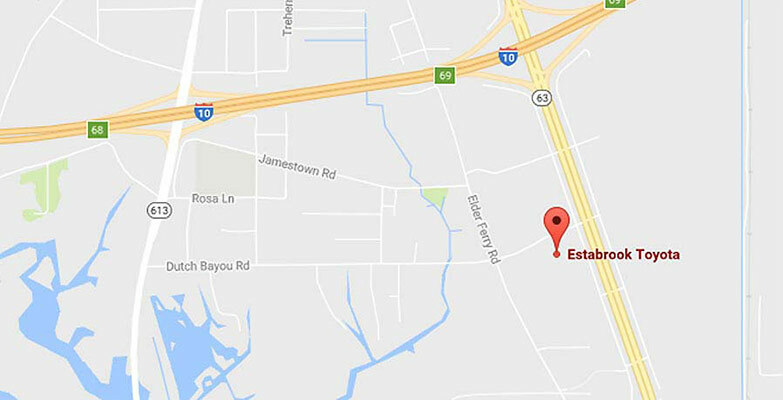 Our family-owned Toyota dealership in Moss Point, MS, is a part of Estabrook Motors, an auto group that's been deeply rooted in the local community since 1951. Estabrook Motors has thrived in Mississippi for 67 years, and while other dealers have come and gone, we've remained a staple in your hometown, ready to serve you and your needs. We invite you to Take a Money-Saving Look at Estabrook, where we'll put you first and treat you to the relaxing car-shopping experience you deserve. When you visit our Gulf Coast Toyota dealership, you'll realize that our owners are never hard to find. They've been working with our staff and South Mississippi drivers for decades, and have helped to create our low-key environment and gimmick-free business approach. Their passion for people and cars has led our Moss Point Toyota dealership to become an eight-time winner of the prestigious Toyota President's Award for outstanding customer satisfaction, further solidifying our commitment to you and your automotive needs. In fact, our honest, straightforward and thoughtful business practices are why many of our staff members have been with us for 25-30 years, and why our customers continue to come back time after time -- because at Estabrook Toyota, you're family. Looking for More Reasons to Buy from Estabrook Toyota? We offer a $750 Toyota College Grad Discount and a $500 Toyota Military Discount, among other new Toyota specials, to help you save on a new Toyota! When you buy a new Toyota from our Mississippi Gulf Coast Toyota dealership, you'll receive ToyotaCare, a no-cost 2-year/25,000-mile maintenance plan, at no extra cost. Most new Toyota models on our lot come standard with either the Toyota Safety Sense™ C or Toyota Safety Sense™ P suite of driver-assistive technologies. Safety features can include a Pre-Collision System with Pedestrian Detection, Dynamic Radar Cruise Control, Auto High Beams and more! If you have bad or no credit, our Toyota finance center can find you a quality subprime auto loan to help you finance a Toyota. Just sit back, relax and watch our network of lenders find the perfect Toyota subprime loan for you. Should your Toyota sedan, truck or SUV be involved in an accident, visit our Estabrook Toyota Collision Center to get the framework, paint or glass repairs your car needs. Need a quick oil change and tire rotation? No problem! Just bring your Toyota into our Toyota Express Maintenance Lane and get a Toyota brake inspection, multi-point inspection or filter change. If Estabrook Toyota sounds like the right Toyota dealership for you, get directions now and come visit us today. We thank you for your business and we look forward to seeing you soon!